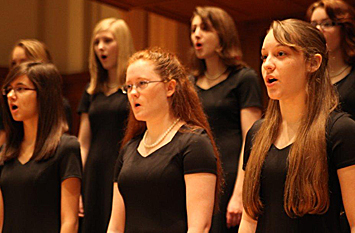 The Lawrence Academy of Music Girl Choir program explores “Elements” in its annual spring concerts Saturday, March 24. Two performances, featuring 300 singers in seven choirs representing grades 3-12, will be staged at 2 and 7 p.m. in the Lawrence Memorial Chapel. Tickets, at $12 for adults, $8 for students and seniors are available online at go.lawrence.edu/buytickets or at the Lawrence Box Office in the Music-Drama Center one hour before the show. 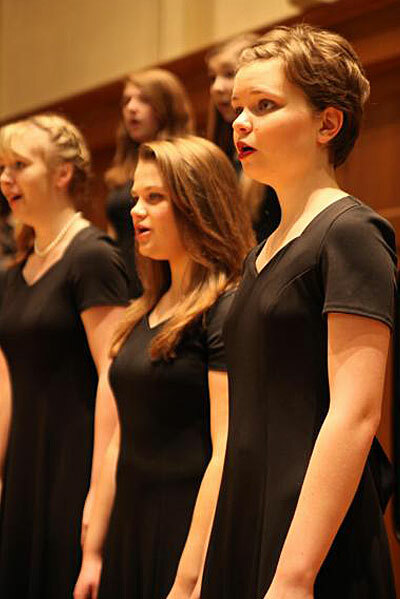 Seven different choirs will perform as part of the Lawrence Academy of Music’s Girl Choir annual spring concerts. The 90-minute program examines multiple elements — of music, of the natural world and of life. The concept of learning to listen with ear, eye, mind and heart as a lens will be explored in a pair of performances by the Lawrence Academy of Music’s Girl Choir during its annual fall concert. The concert, entitled “Ting,” which is the Chinese character for “listen,” will be performed Saturday, Dec. 9 with performances at 2 p.m. and 7 p.m. in the Lawrence Memorial Chapel. Tickets, at $12 for adults, $8 for seniors/students, are available online or at the Lawrence Box Office the day of the concert from 12:30 p.m. – 4 p.m. and one hour prior to the evening performance. 920-832-6749. “Given the deep social divide into which our current singers are coming of age, I felt strongly that a focus on learning to listen—‘in music and in life,’ as we say—would be an asset to them well beyond our rehearsal walls,” said Karen Bruno, director of the Academy of Music, who employed various aspects of the concept of listening into the repertoire and rehearsal process this fall. The concert will feature more than 300 singers in grades 3-12 from all over the Fox Valley performing a wide range of music by significant composers, including Mozart, Bach, Benjamin Britten, Antonín Dvorák and Ralph Vaughan Williams, among others, as well as Brazilian and Norwegian folk songs. 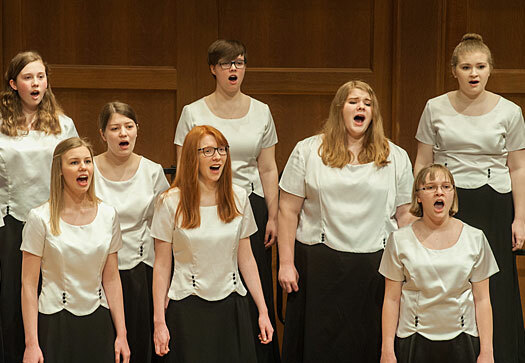 More than 250 voices will lend their talents to music that has stood the test of the time — from lullabies to spirituals — in the Lawrence University Academy of Music’s Girl Choir concert “Choral Classics” Saturday, Dec. 10 in the Lawrence Memorial Chapel, 510 E. College Ave., Appleton. 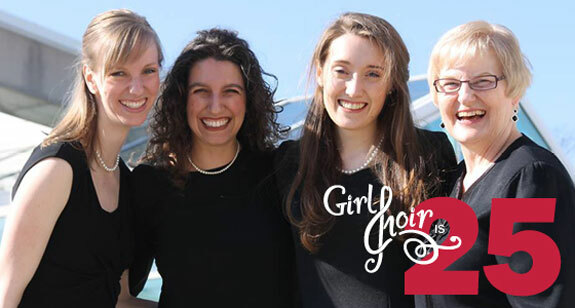 For the first time in the girl choir’s 15-year history, the concert will be performed twice on the same day, at 2 p.m. and 6:30 p.m. Tickets, at $10 for adults, $7 for seniors and students, are available at the Lawrence Box Office, 920-832-6749. The concert will feature performances by five separate choirs — Primo, Allegretto, Intermezzo, Cantabile and Bel Canto — under the direction of Molly Tomashek, Cheryl Meyer and Karen Bruno. Members of the choirs, selected by audition, include girls 8-18 years of age representing more than 50 schools from throughout northeast Wisconsin. Selections to be performed include Handel’s “Give Thanks and Praise,” the Scottish folk song “The Raggle-Taggle Gypsies,” Schubert’s “Benedictus” and Gustav Holst’s “Ave Maria,” which is widely considered a masterpiece among women’s choir literature. “The repertoire that will be performed in this concert is exceptionally varied,” said Karen Bruno, artistic coordinator of the girl choir program. “We will feature European ‘art music’ from as early as the 16th century, as well as more contemporary American choral compositions and folk songs from several foreign countries. 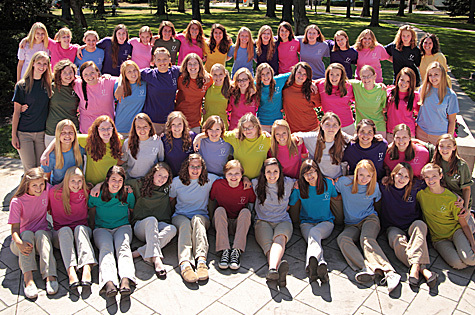 Founded in 1991, the Lawrence Academy of Music Girl Choir program provides quality choral opportunities for girls in the greater Fox Valley area and encourages the development of vocal technique, music reading skills, creativity, expressive artistry and an awareness of various cultures. The Girl Choir of Lawrence University’s Academy of Music will present a concert of “Yuletide Carols” on Sunday, December 19 at 3:00 p.m. in the Lawrence Memorial Chapel. Tickets are $8 for adults and $6 dollars for students and seniors. They are available at the Lawrence University Box Office (920-832-6749) beginning December 6. The concert will feature both familiar and new Christmas music, with several pieces using combined choirs and audience participation. The five choirs, conducted by Molly Tomashek, Cheryl Meyer, and Karen Bruno, contain over 200 members in all. The choirs consist of girls in grades 3 through 12. The Cantabile Choir, whose members are in grades 7-9, will travel to New York in April to sing in the world famous Carnegie Hall. The Girl Choir Program of the Lawrence Academy of Music seeks to provide quality choral opportunities for girls in the Fox Valley region. Through the study and performance of the highest quality music, the girls develop vocal technique, music reading skills, creativity, expressive artistry, and an awareness of various cultures. 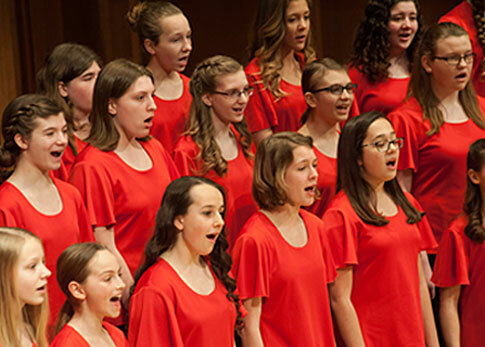 The Girl Choir Program strives to create an atmosphere that encourages girls to respect the uniqueness of others, to take risks that foster individual growth, and to continue their development into self-assured young women. Currently there are over 200 girls singing in the Girl Choir program. They represent over 50 schools from throughout Northeastern Wisconsin.